South Korean actress, Jo Yoon Hee (조윤희) attended InStyle 11th Anniversary Party held at The Galleria in Seoul, South Korea on March 12, 2014. 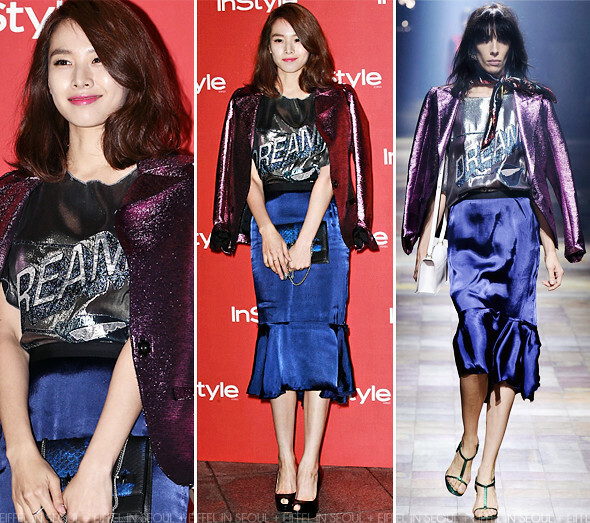 The actress wore a metallic lamé three-piece outfit from Lanvin Spring/Summer 2014 collection. A blue clutch bag and a pair of Giuseppe Zanotti peep-toe pumps completed her look. I'm getting bored with the blazer over the shoulders combo. It screams repetition. And I personally would have loved an up-do and darker eyes. All that aside, I semi like the ensemble.